Wild Digital - X-Stands - Lightweight attractive graphic displays. The X-Stand display certainly makes a statement with its striking good looks and lightweight framework. It is so incredibly light that you can easily take it anywhere with you. Use it to bring attention to you and your products at a show then take it back to your showroom. 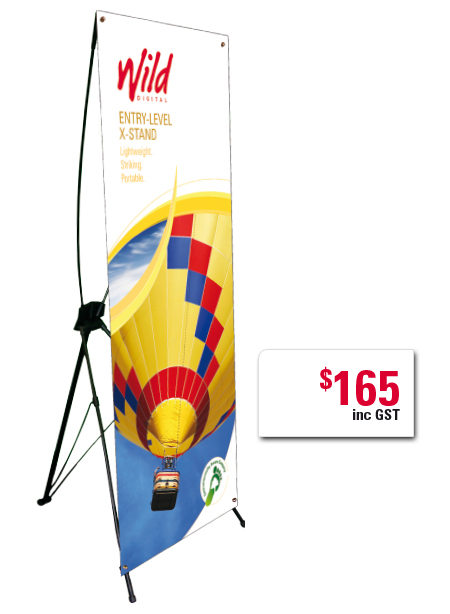 It is ideal for exhibitions, trade shows, conferences, promotional advertising and any where else where you need to make an impact. The X-Stand packs away into a compact little bag so you’ll hardly notice when you carry it. The graphic banner has eyelets in each corner that simply clip onto the framework so setup and graphic change over is a real breeze. Use the same eyelets to hang the graphic in your showroom. Sizes: 600mm wide x 1550mm high.